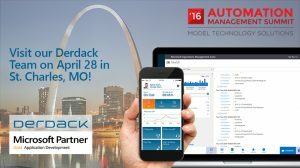 Visit Derdack at the Automation Management Summit in St. Charles and discover our MS-certified solution Enterprise Alert, providing fully-automated IT alerting & app-enabled anywhere response. Derdack enables an up to 10x faster response to major and critical incidents threatening the continuity of services and operations. This is in particular important for 24/7 operated mission-critical systems, e.g. customer-facing IT, energy distribution and manufacturing processes. Derdack’s EnterpriseAlert® solution uniquely combines reliable and fully automated alerting, anywhere collaboration and app-enabled incident remedial. This enables a closed-loop incident handling for a super-fast and super-effective incident response and resolution. Actions can be taken before incidents impact business continuity and customer service levels. Founded in 1999, Derdack is a long-standing member of the Enterprise Cloud Alliance and a Microsoft Partner Application Development Gold competency. Don’t miss René Bormann’s, Derdack R&D Team Lead, session and live demo on Mobile real-time alerting & app-enabled anywhere response for OMS taking place on April 28 at 11:15 am in Imagination Room D. Discover how to add Derdack’s capabilities to your OMS-enhanced cloud. If you are interested in arranging a meeting at the show, please contact Ms. Susann Groeger at +49 331 2987830 or sgroeger@de.derdack.com. We are looking forward to meeting you!